This Friday Five, reflect with me upon art and the role it plays in your life (and ministry!). 1. Do you have a favorite piece of art in your home? Was it made by you or someone you love? Was it a gift or something you decided to purchase? We have some great art in our home, because a number of years ago, we decided not to buy t-shirts on vacation and buy art instead. So we have a wall hanging from Lesotho, water colors from South Africa and Italy, fabric art from Haiti, etc. Great reminders of our travels that are much better than “my mom went to San Francisco and all I got was this t-shirt”. We have a lot of Native American art–Navajo rugs, pottery, kachinas, sand art, etc. And a painting by Anthony Chee Emerson that we love. I have an oil painting of the Boise skyline by Wendy Blickenstaff that I picked up at the artist’s yard sale and love, love, love. But our favorite piece of art is the photograph that Ansel Adams took of Justin’s grandfather, Al Glass, preaching an Easter sunrise sermon on Mirror Lake in Yosemite. Come visit and admire. 2. What do you think of the the art in your place of worship? Does it enhance the worship experience? Would you add to it, take away from it, or otherwise change it? 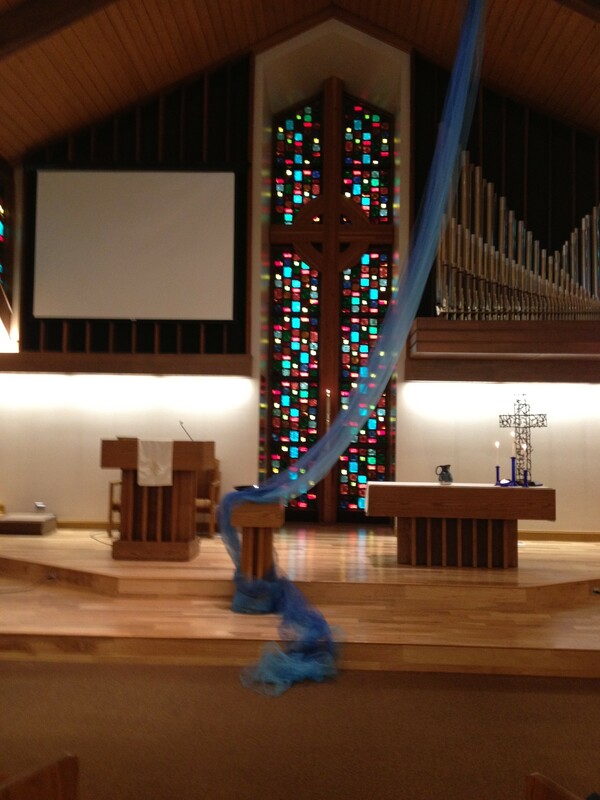 Our sanctuary has stained glass that does enhance the sanctuary. It is a fairly “modern” space, and the amount of stained glass we have fits it well. And we have a Prayer Center in the chancel, which is art in a flexible and changing sort of way. 3. What public art have you loved– or hated? There is a graffiti wall on one of our neighbor’s fences. As far as graffiti goes, I guess it is well done. But not a fan. But it is their fence. Whatever. 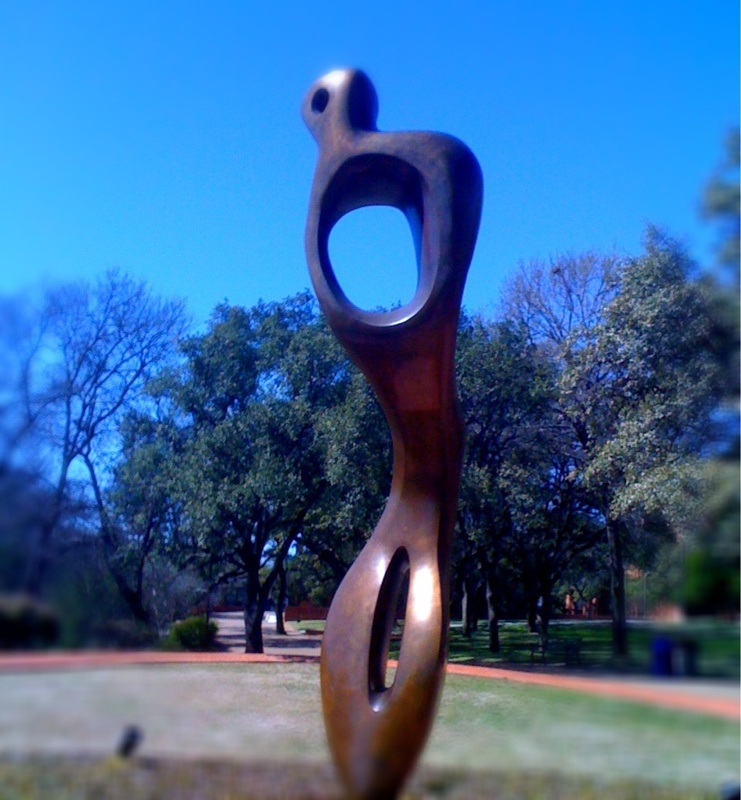 The public art that I love is at Trinity University, where I went to college. Trinity has great fountains and other outside gathering spaces that are built around art, including a number of Henry Moore bronze pieces. Large Interior Form is probably my favorite. (Photo courtesy of Michael Karshis). I also just visited the Getty Museum in Los Angeles. It is a good illustration of how architecture functions as art. The High Museum in Atlanta did the same thing for me. The very building spoke to my soul. 4. What piece of art (famous, infamous, personal, or very, very well known masterpiece) speaks to your soul? 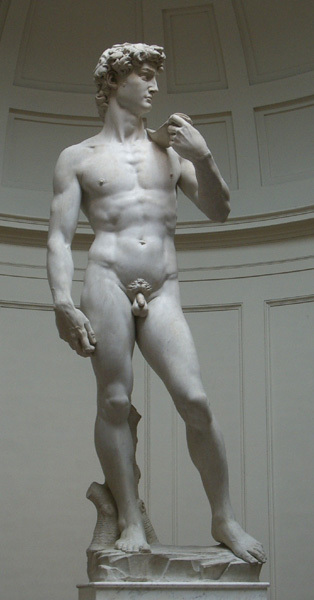 I was sort of surprised by how much Michelangelo’s David touched my soul. The image is so ubiquitous, but encountering it in person was a whole different thing. Don’t really have words for it. 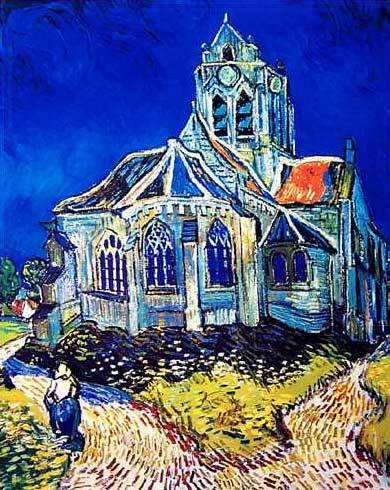 Almost every painting by Van Gogh speaks to my soul. His paintings are so tactile. I am sure I will be arrested for trying to touch one in a museum one day. The reproductions don’t quite measure up, but here is one that hangs in my house. And I loved encountering this painting by Burnand at the Musee d’Orsay. 5. When is the last time you created something beautiful, just for you? Every so often, I will use the water colors in the prayer center. And our all church retreat this summer was about the Psalms and involved some art. But most of my creative work is with words or music. So, friends, what art speaks to your soul? October 5, 2012 in Art, Friday Five, Reflection. I’ve always loved Van Gogh — something about the color combinations and the style of drawing has always been inherently pleasing to me. “David” for me is something I have to lecture about, so somewhat less moving. The art I’ve been moved by most recently is by an artist who claims to conform to Reformation-era / Calvinist aesthetic principles: Henk Helmantel http://underpaintings.blogspot.com/2010/07/random-inspiration-henk-helmantel-part.html I especially like the image of the book (page down a bit). The art both inspires and calms and seems inherently spiritual despite its typically quotidian themes. All art speaks to my soul, some positive, some negatively. Art is a portal into it’s creator’s soul, The act of expressively creating art, whether subconsciously or on purpose, is an act of intimately communicating with the Creator. If art does not speak to your soul, it is because you’re not listening. Thanks for introducing me to Henk Helmantel. Thankful for my trip to the Getty last week, but it has reminded me of how much I miss having a great museum nearby. So many artists I have yet to encounter. In 1070 I visited Madrid, and attended a bullfight. I brought home a poster of a bullfighter, rolled it up, and forgot about it until we moved into our very small dwelling close to church three years ago. I found it, had it framed, old as it was, and it’s in the living room, with bright yellow walls, and furniture that’s red/orange/brown/yellow/and black. I have a wall with movie stars, Catherine Zeta Jones my favorite. Another wall with black and white family members, dating back to Jim’s dad in McCall fishing as a small boy. I have delicate counted cross stitch done by my daughter, as well as her water colors. My son has done oils, and pencil art that are on display throughout the house. So basically you can’t see my walls. I wish my taste were more sophisticated, but I am so quieted and touched by my children’s works that I can find space and peace within them. 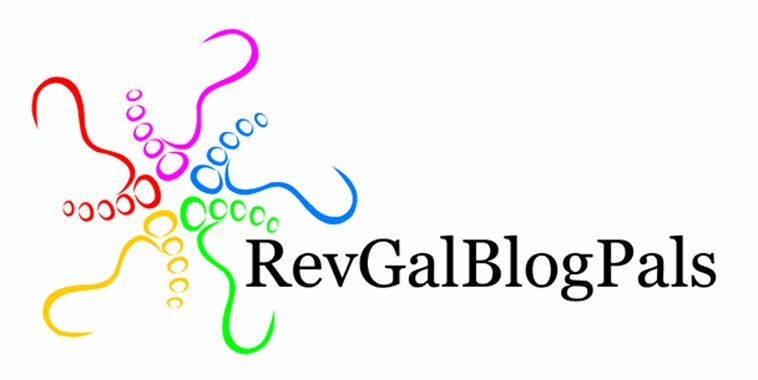 Really wonderful post Marci! I love the idea of bringing back art from vacation, and have done so. The idea of a family portrait by Ansel Adams kinda makes my jaw drop! 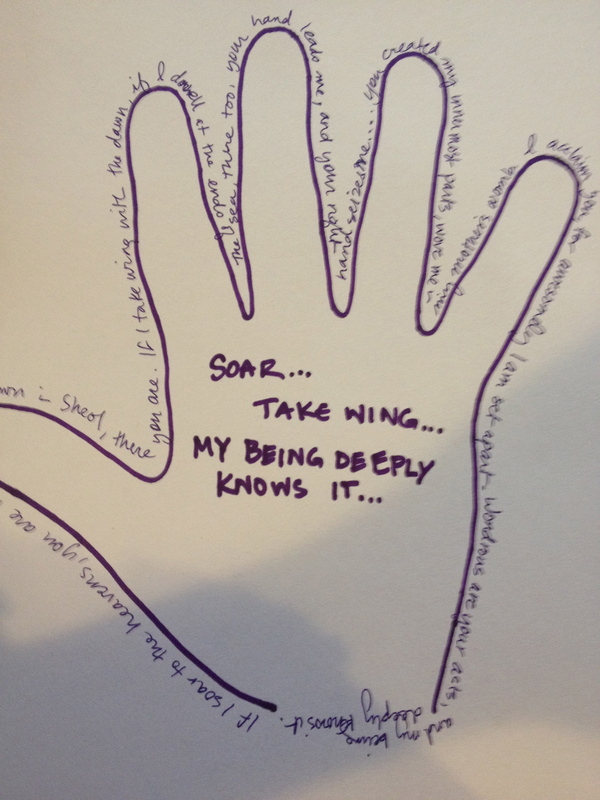 Thanks so much for your thoughtful reflections. Oh, I love your sanctuary! I’d love to see that Ansel Adams photograph. What a treasure. And what a great idea to collect art instead of the trashy stuff they sell in tourist shops. Am reminded of the folk art collectors whose collection comprises the Folk Art Museum in Santa Fe. yep, buying art beat buying t-shirts by a country mile. Thoughtful, revealing play; beautiful images, thanks!